The Vermont Foodbank's VeggieVanGo mobile food pantry will be back at CVMC on Friday, April 26. Get collaborative care from a team of local orthopedists and access to the latest treatment technology from the UVM Health Network–all right here. Introducing the Daisy Award™ at CVMC. Tell us your story of how a Nurse made a difference in your experience today. Integrative Acupuncture and Oriental Medicine offers $10 acupuncture treatments at CVMC Integrative Family Medicine in Montpelier. The Vermont Foodbank's VeggieVanGo rolls into CVMC with its latest crop of healthy produce and other groceries. Take your unwanted or expired drugs in to National Prescription Drug Take-Back Day on Saturday, April 27, 2019 from 10 a.m. to 2 p.m. Drop off sites are avalilable around central Vermont. Find a site near you. 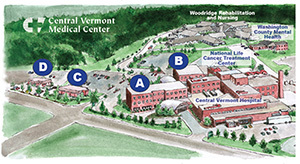 Hear from our employees why CVMC consistently ranks as one of the top places to work in central Vermont and is recognized as one of top 20 rural hospitals in the country. This short, relaxing yoga sequence offers gentle poses with whole body movement along with modifications for beginners. Find out from Sylvia Gaboriault, registered dietician and certified diabetes educator at the University of Vermont Health Network - Central Vermont Medical Center. Launch your career today by exploring all of the exciting job opportunities currently available at The UVM Health Network - Central Vermont Medical Center. Having a primary care doctor is important to your general health.Our primary care providers are here to help you at every stage of your life, from newborns to adolescents and from adults to seniors. At the CVMC, our Board Certified obstetricians and our highly skilled and compassionate nursing staff provide collaborative, high quality, family centered care for the well being of women and children. We offer a broad spectrum of cancer care services in a caring, professional and collaborative environment that features some of the most advanced treatment options available today. Our team of highly trained and qualified physical, occupational and speech language therapists are dedicated to helping people regain their highest possible level of functioning. Woodridge, known for excellence in nursing, provides both long-term and short-term care to individuals needing nursing and rehabilitation services. Whether you are facing a life threatening injury or have a minor illness that needs urgent care, our CVMC ExpressCare clinics or Emergency Department have you covered 24/7.